* 신부전 환자 는 절대 섭취하지 마세요 ~! * 어린이 는 섭취 불가 ~! Cellulose, Cellulose (capsule), Maltodextrin, Stearic Acid (vegetable source), Silica and Magnesium Stearate (vegetable source). 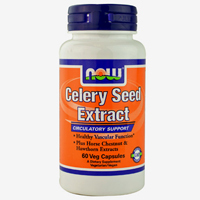 NOW® Celery Seed Extract offers a wide array of bioactive compounds including natural phthalides such as 3-n-butylphthalide (3nB). 3nB is extensively researched for its ability to support vascular health, especially within the brain. This product includes Horse Chestnut Seed Extract, which has been long known to support healthy vascular function. Hawthorn Extract with its many phenolic constituents has also been included to complement this 100% vegetarian formula.